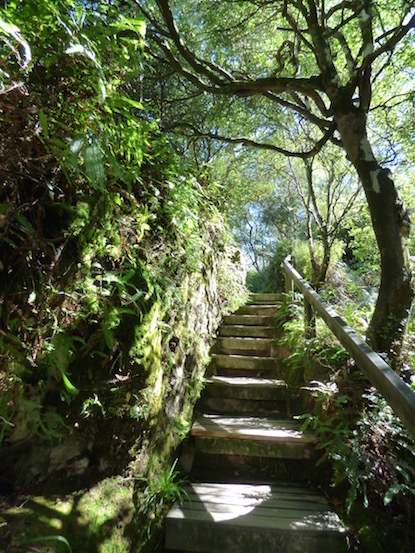 Galley Wench Tales: NZ's Best Geothermal Attraction? Given Orakei Korako was a mere 5-10 minute easy paddle across gem like Lake Ohakui from Rotota, I couldn't resist checking it out. 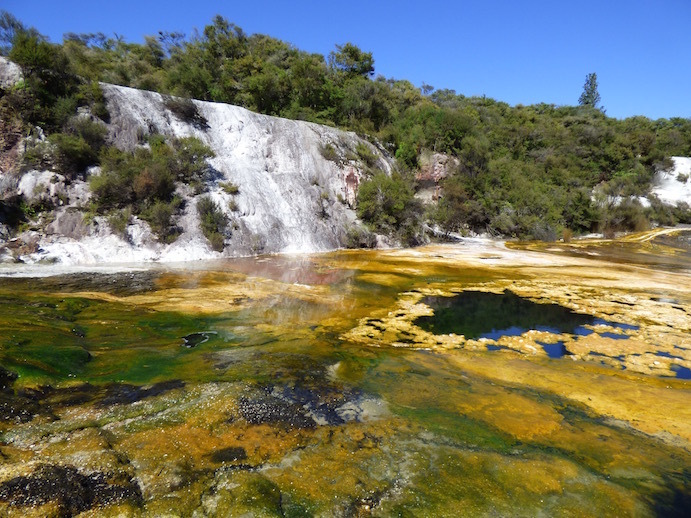 Besides, Orakei Korako featured most of my geothermal favorites.... cauldrons, geysers, vividly colored mineral pools, gurgling, bubbling mud pools and a well-maintained walk. Algae paints colorful streams at Orakei Korako. 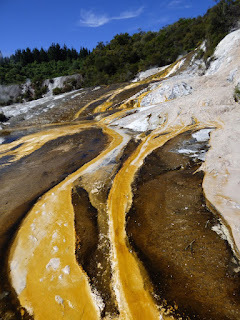 Orakei Korako is missing cool bath areas, like a number of my old favorites in the Pacific Northwest like the delightfully quirky Bagby Hot springs and Breitenbush. 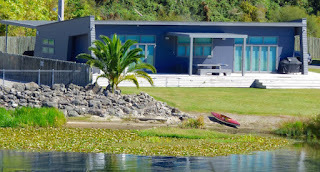 Then again, staying at Rotota, my needs in that area were more than well met. 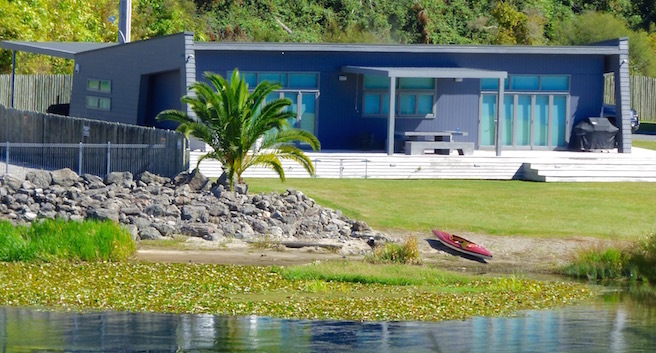 Otherwise I might've urged Wayne to track down Kerosene Creek, a cool - well, hot - soaking pool in the Rotorua* area. *On the way to Rotota, we passed through Rotorua aka "RotoVegas" given its touristy reputation. its geothermal features wowed me. 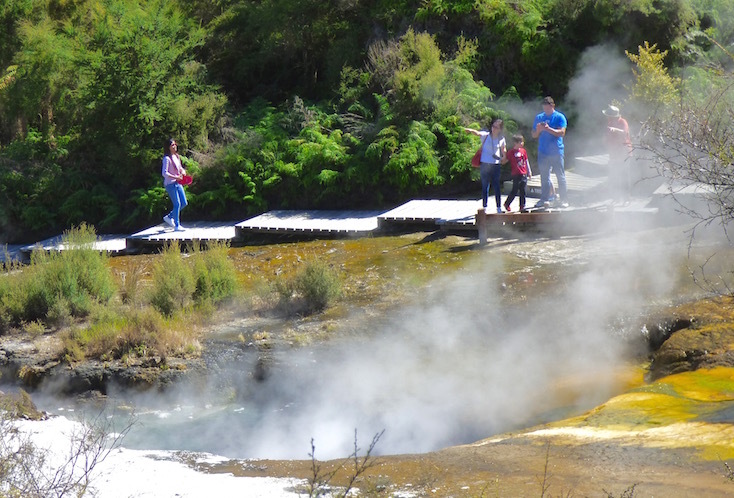 While Orakei Korako is far from free at $34 NZD (about $20), unlike many other popular geothermal attractions, it's not stinky. The hour and a half walk -- less for those who take less time photo-taking than me -- was perfect for a sunny afternoon with nothing on my agenda. 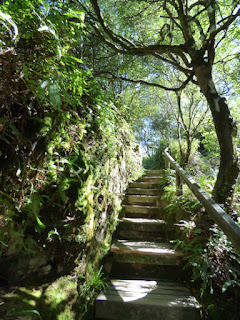 The walk was easy, with broad boardwalks, some scattered steps and relatively gentle ups and downs. The area oozes stunning primordial atmosphere, with lush ferns both underfoot and luxuriant palm-tree-tall varieties towering throughout the steaming rolling hillsides. 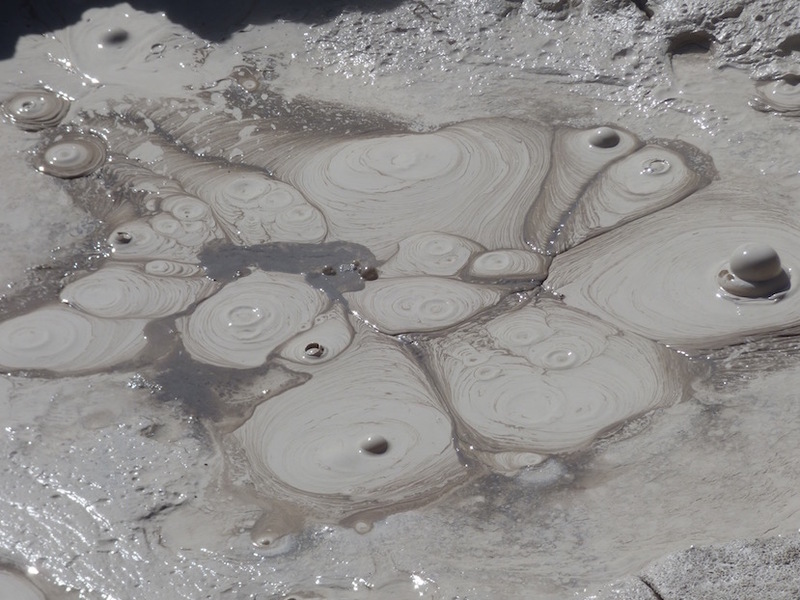 Mud pools - look cool and sound even cooler. 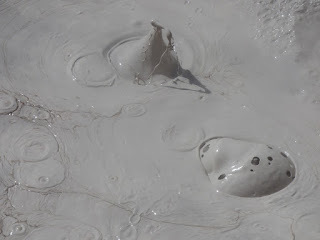 Closer view of the mud pool. Ohhh they sound so cool as the bubble and pop! contrasting browns, light grays and whites. and in Yellowstone were strictly hands off. You'd boil alive. Nonetheless, I can't honestly compare Orakei Korako to many other New Zealand geothermal sites because I haven't seen many. What I've heard is Orakei Korako is one of the least commercial-touristy of the larger Kiwi geothermal sites. From locals, I've heard Champagne Pools is one of New Zealand's other most worthwhile paid geothermal sites. Orakei Korako's Map of Africa and Rainbow Terrace area. 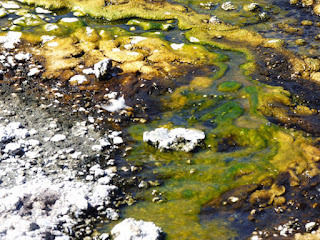 I confess, if you can stand the hordes of tourists, of all the geothermal places I've visited, Yellowstone's tough to beat. 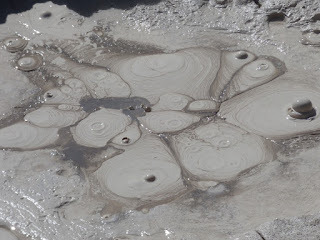 Like Yellowstone, as cool as geysers, naturally psychedelic mineral pools, algae and mud pools are, the less dramatic serene beauty of the less crowded places that seem to surround these sights (like the Beartooth Mountains outside Yellowstone) are more to my liking. Still, if you're in the area (especially Rotota) and have the time and money, Orakei Korako's worth the time. 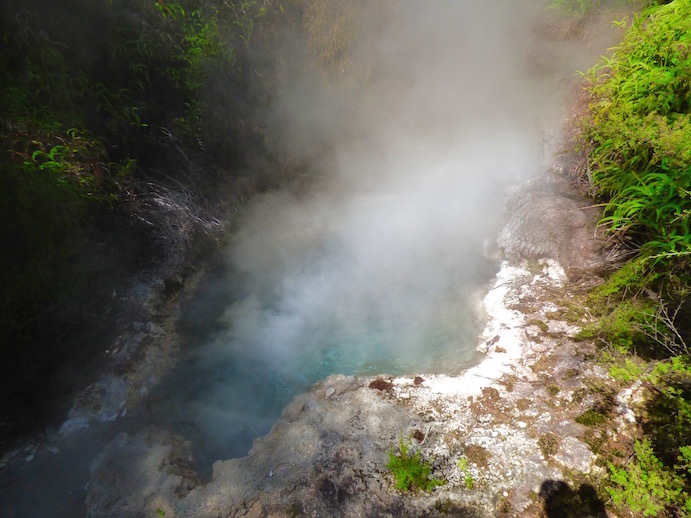 Panorama of New Zealand's Lake Ohakuri, as seen from geothermal attraction Orekei Korako, not far from Lake Taupo. Orakei Korako,to formally pay to enter their geothermal park via ferry. 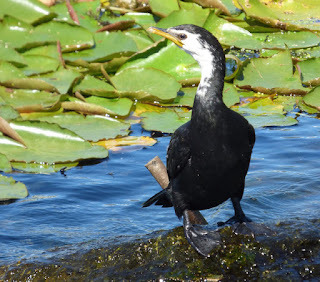 Our boat’s finally back on a pole mooring in Whangarei’s Town Basin Marina (S35.43.412 E174.19.539), We've been road-tripping for the last several days, though by the time you read this, likely we'll be back aboard Journey. At the moment, we're in near Cathedral Cove, in the Coramandel area.